ACTC » Info » Publications » Restart Magazine » Selected Restart Articles » How I discovered that MCC has nothing to do with cricket! How I discovered that MCC has nothing to do with cricket! I first met Derek Reynolds about 20 years ago. I was running a wine tasting night class. He and Margaret were students. Over the years I became to know him quite well, though there were hints of a secret life. He sometimes talked of going away for the weekend with a friend in his car, and there was the sudden wearing of a T-shirt proclaiming ‘I thought Bamford Clough was a football club manager until I joined the MCC’. What was going on? I wasn’t to find out properly until a few years later. “Fred, Tony Branson’s son is growing up and I think he will be replacing me as his trials navigator. If I buy a car of my own would you be interested in becoming my navigator?” (No mention of bouncing up and down in the back seat, or rebuilding cars in the pouring rain at 4 o’clock in the morning) I naively said, “Yes that sounds like good fun, I always fancied rallying”. Nothing more was said for a couple of years until Derek told me that he had bought a car and asked if I was I still willing to navigate. 1. “We need to drive 200-300 miles to reach the start of any trial we enter. This car will cruise very happily on motorways and is comfortable.” Where on earth are we going? 2. “It has a De Dion back axle, this gives good ground clearance as the differential is tucked up high in the car’s body.” Why does it need good ground clearance? 3. “Tony has achieved a gold medal in one these.” So! 4. “Automatic transmission is good on hills.” Is it? Incidentally, when the Daf is set up well and behaving properly it is amazing how many cars you can out accelerate from a standing start, we don’t need to change gear you see. It had been ‘trial prepared’ by Tony and Derek. I later discovered that this entailed putting an extra leaf in the rear springs, inner tubes inside the tyres and attaching two spare wheels to the boot lid. October 1995, The Edinburgh Trial that for some reason didn’t go any where near to Edinburgh and mostly takes place in Derbyshire. Derek had elected to start the trial at the bottom of the M1 at Scratchwood Services and we needed to be there by 11.30 pm. “There is plenty of time if we set off from home by 6pm”. We got as far as the top of the A19 Bridge over the Tees when we had our first of many punctures together. This set us back a little, but not as much as a mysterious propensity for the car to cruise happily for several miles and then just gradually go slower and slower until we had to stop. After a couple of minutes standing at the side of the road it would restart and run beautifully for a while when the whole thing was repeated. 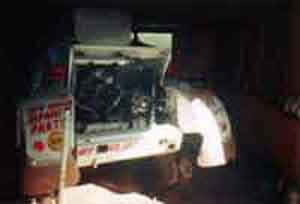 We now know that the carburettor was icing up, a problem that has recurred on many subsequent occasions. We arrived with about ten minutes to spare to find Tony convinced that we had had an accident. Not the best of ways to begin your first classic trial, still it didn’t gives us time to too apprehensive. The route directions were a joy to follow, clear and precise. We approached our first observed section as dawn was breaking; driving down a misty valley on the approach to Excelsior was a magical experience. We cleared the hill with ease! Beginners luck. We had been told that we mustn’t be early! Around Fernilee/Errwood reservoirs we found ourselves about 1 hour ahead of scheduled time, so Derek decided that we must stop until we were back on time. We sat, or rather I sat and Derek slept, at the side of the road and watched about sixty cars drive past us. Were we mistaken? Did they know something we didn’t? We now realise that it is the time checks you have to watch not the sections. Shortly after recommencing our journey we found ourselves at a holding area, a quarry road in a big wet cloud halfway up a mountain. We were 70 cars back from the front of the queue where all the people who had passed us earlier were about to go on to Bamford Clough. Two hours later and two hours behind time it was our turn to go. Derek had told me this was the ‘Big One’ and now we were on the start line ready to go. The car travelled a few yards and stopped, lots of noise and smoke but no further movement. Disgrace and ignominy. For the first, and not last, time we made our way back down to the road and headed to Haggside. This is where I discovered exactly what a navigator is for, not for finding the route but as heavy mobile ballast. The best way, so I am assured, to get a Variomatic up a hill is to get it going as fast as possible and keep it going as fast as possible without crashing. This is exactly what Derek did; I saw nothing of the hill just a blur of stones and vegetation I also bashed my head on the roof in my enthusiasm to bounce up and down, we cleared without any trouble. We were really pleased with ourselves. We arrived at the finish in Buxton to collect our first Finishers Certificate to find we were so late that search parties were out looking for us. So much for worrying about getting ahead of time. 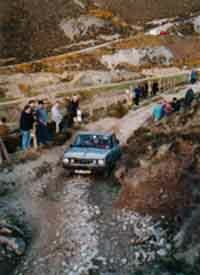 Our journey to the start of the 1996 Exeter Trial was as uneventful as these things ever are, apart from the car’s desire to freewheel on long gentle downhill stretches on the road to Cirencester. We arrived without fuss at Gatcombe Lane, the easiest section in all Trialdom. We crept towards the start were we stopped and readied ourselves for the start (we had even lowered the tyre pressures just in case). Attempts to zoom away were met by horrible grinding noises and lots of smoke; we failed without even moving off the start line. This hill is so easy that I don’t even think there is a contingency for failure, however we somehow made our way back to the road where the car expired. A very kind competitor rang the RAC on his then rare and costly mobile phone. Three hours later a friendly (they always are) RAC man arrived. “Your clutch has gone,” he said. “What clutch?” we said “It’s belt drive you don’t need one!” “Oh yes it has, look”. He showed us where it was and how it worked (apparently he used to service Dafs when he was an apprentice). Much to the surprise of our womenfolk, we returned home on the back of a lorry, a day earlier than expected. We were very confident that the car was in perfect condition when we set off on the Thursday (we had been invited to see a factory that makes foam for furniture and intended stopping overnight somewhere near the start). Our first inkling that all was not well was when the car wouldn’t restart at a petrol station on the A1. We couldn’t work out what was wrong but the distributor had turned about 90º from its normal setting. The RAC man, who was as puzzled as us, reset the distributor as best he could and sent us on our way. By the time we reached the factory we had the timing set up quite well and began to put the problem to the back of our minds. 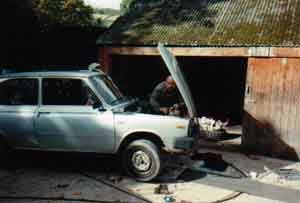 Next day we ambled around Derbyshire visiting the sights, even coming across a farmyard full of Trabants. That night we set off on the trial and had an uneventful overnight run and were feeling very confident when we parked on the approach to Clough Wood. It wouldn’t start! Looked under the bonnet and found the distributor had turned again! This time turning it back to it’s proper position failed to do anything other than cause huge backfiring. What was wrong? We were running very near the back of the field anyway so were soon retired from the trial. Along came our white knight, Trevor in his 4wd. He looked at our problem and said “I know a little bit about cars, tell you what, I’ll tow you up to my house where we will be more comfortable and I’ll have a go”. Trevor’s “little bit” was revealed when he showed us his dune buggy: Mazda rotary engine, independent chain drive to each wheel, suspension with 36 inch vertical travel, large knobbly tyres etc. It was the sort of buggy that races in the Sahara Desert, and would climb Simms etc without even losing breath. He also has a full engineering workshop beside his home. After much delving it transpired that the problem was something that probably only happens very rarely. One of the distributor bob weights had come adrift, no great problem whilst the engine is running but the Daf’s Renault based engine has a habit of running backwards when it is turned off. This caused the bob weight to jam the distributor and shear the drive shaft as a result. Trevor left us to work on recovering pieces of metal from the sump and set off to a scrapyard that he knew of in Wirksworth. He returned two hours later complete with distributor and drive shaft from a Renault engine that just happened to be sticking out of a pile of scrap. A bit more work under Trevor’s guidance and we were up and running, arriving in Buxton in time to meet everyone at the finish. Tony Branson has documented this story in greater detail in the March 2000 edition of Triple. Our clutch despite the administration of pineapple juice gave up the ghost on Darracot. Somehow we made it up to road before it disintegrated entirely. A competitor in VW Buggy very kindly offered to tow us to Widemouth Bay. During a terrifying journey at the end of a 10 foot towrope, Derek happened to mention that he thought that part of our ballast was an old clutch plate. Indeed there it was, down to the rivets, but an almost viable clutch plate. With the loan of some equipment from the service station we replaced the clutch plate and were back on the road in 3½ hours arriving at the Lands End finish in time for a drink. That clutch plate and the one surviving engine mounting got us the 450 miles home. There have been several highpoints over the last five years. In 1998 we won a bronze medal on the Edinburgh. Clearing Bamford Clough on the way, to the surprise of one or two hardened campaigners who had failed earlier. 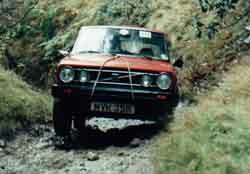 The 2000 Clee Hills was one of the most enjoyable trials we have been on, we climbed Hungerford for the first time and almost made Gatten’s Gamble, failing about five yards from the top. We are now running in our third Volvo 66, a bright yellow model with only 39,000 genuine miles on the clock. The first car died of compulsive rust disorder after completing about three trials. I refused to travel in it any more after the bottom seat belt mounting came off in my hand. Derek still feels that this was the best runner of the three. The second car (The Silver Shadow) lasted almost five years but became terribly unreliable towards the end. It kept blowing fuses, especially the one that controls the vacuum gear change mechanism so that we would change to the equivalent of top gear half way up a hill. The death knell was sounded after the front sub frame was twisted seriously out of shape. This happened as a result of first being winched out of the bomb crater on the Northern Trial and then over the chicane half way up Blue Hills 2. Derek and I have remained good friends over the years and bicker like an old married couple the whole time we are trialling or trying to repair the car. Most of the things we disagree about are very trivial. I, of course, am always right but because it is his car I usually let him have his way. We spend a lot of time debating what tyre pressures to use. Derek always sets them lower than I think is suitable, consequently we often grind to a halt with the tyres gripping the ground as if glued and the clutch/belts producing large clouds of smoke. Derek loves car boot sales and has a comprehensive set of 17mm spanners. I find it difficult to persuade him to only bring one and leave the other six at home. There is a magic switch on the Daf that in theory holds it in low ratio, but Derek is convinced it doesn’t work and is the reason we fail so many hills. So he often forgets on purpose to use it. Derek always disappears five minutes before our start time and we are usually late in setting off. He says you should take every opportunity you can, but why does he have to leave it so late! It is no good telling him to look for road signs – he doesn’t see them. The navigator has to spot them and give him plenty of time to manoeuvre. We have all sorts of fanciful plans for the car. Does anyone know where we can buy a supercharger suitable for a 1.4 litre Renault based engine? Of course if we did install one we would then need a vacuum pump for the Variomatic. Would the clutch/belts cope with the strain? The future looks interesting and possibly smoky.